Alpari UK clients and creditors had the opportunity to vote on a number of measures on Thursday, overwhelmingly in favor of resolutions for the approval of joint Special Administrators proposals and for the formation of a creditors’ committee. A previously announced meeting between Alpari UK clients and creditors took place in London on March 12, 2015, with the results of the meeting reported via an update from KPMG. Earlier today, Forex Magnates reported that just over 13,000 Alpari clients were entitled to claims over $100, with the largest 126 customers of Alpari looking to receive close to $50 million as KPMG announced that it had received no offers for Alpari Japan. 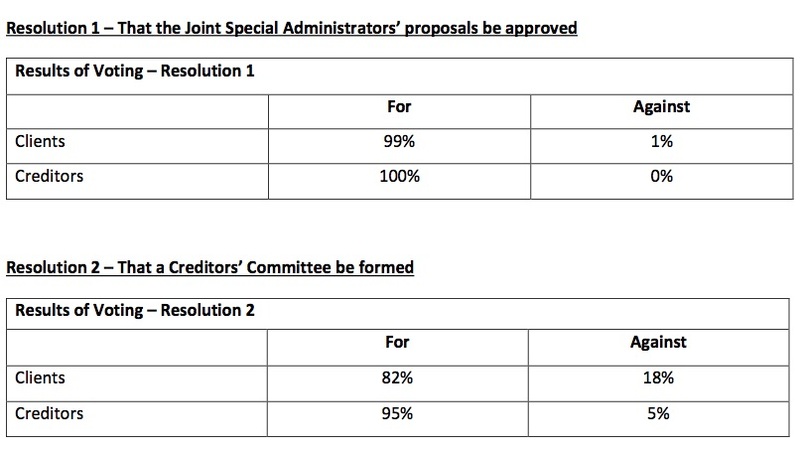 For Resolution 1, that the Joint Special Administrators’ proposals be approved, the overwhelming consensus found that 99% of both clients and creditors were in approval. Moreover, for Resolution 2, that a creditors committee be formed, results were not quite as uniform, though no less convincing, with an approval rating of 82% for clients and 95% for creditors. According to a KPMG statement and subsequent measure, given that more than 50% of both Clients and Creditors voted in favor of the resolutions 1 and 2, both resolutions were subsequently passed. Representing clients were entities FSCS and Astrocyte Capital Limited, having been represented by Pier Carbone and David Miron. Alternatively, the entities representing the creditors were Go Markets Pty (voiced by Robert Berkeley) and Royal Forex Trading S.A.L. (represented by Salem Kattoura). Given the passage of Resolution 2 in particular, the initial meeting between clients and creditors did not include an addition string of up to four resolutions, which will be completed at a later date. I do commend the UK and the special administrators for being fairly transparent about this whole thing. This reduced the panic and the ‘what’s taking so long?’ questions on the forums considerably. FM should follow up when payouts are actually performed, and when they are almost complete.